The Korean government will go stricter with its vehicle collision test for newly built passenger cars this year to better conform international car safety rules set by international agencies such as the European New Car Assessment Program (Euro NCAP). Cars will be randomly selected and purchased from a showroom and will be tested on the impact on dummies in front and back seat. On Monday, the transportation ministry announced a plan to revise its mandatory passenger car safety test system to reflect the new standard. The government has tested crash safety for new cars in 22 categories including collision, pedestrian care and accident prevention, to select and award safety champions each year. Under the new rule, vehicles for car collision testing will be randomly selected by the ministry from those rolled out from the factory and also in showrooms. In the past, test vehicles were mainly provided by manufacturers because of budget constraints and difficulties in obtaining cars that come with minimum options. But the practice raised fairness concerns among consumers. The Board of Audit and Inspection already recommended random purchasing of production cars with minimum options for more transparent and objective testing. The impact on back-seat passengers will also be added under the new guideline. 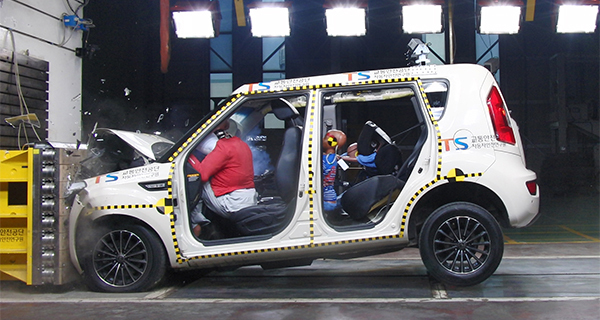 Previous crash tests were limited to grown-up male or female dummies in the front seat. A child dummy or a baby dummy in the back car seat used in past tests was only for side collision or partial head-on collision.